Dog and person camping. Photography by Shutterstock. Confirm that the campground, state or national park you want to visit allows dogs. Find out the rules that apply to dogs at that particular location. Will your dog have to be on leash at all times? What length leash is required? On many campgrounds, dogs must be confined to camping areas and aren’t allowed near beaches, lakes or picnic tables. Some campgrounds are super dog friendly but may also charge a fee for each dog. Just as you bring bug spray for yourself, ensure your dog is up-to-date on his flea and tick medication and heartworm prevention. Insecticidal garments, blankets and beds for dog that have been treated with permethrin are great as an added layer of protection. Check your dog for ticks every day if he has been rummaging in weeds, shrubs or tall grasses. Camping is synonymous with hot dogs, hamburgers and s’mores — all temptations for your furry friend. Campground garbage cans can also overflow with refuse that may prove to be irresistible to your dog. Other campers’ dogs might not be friendly. Children in the area may rush up to your dog and surprise him. 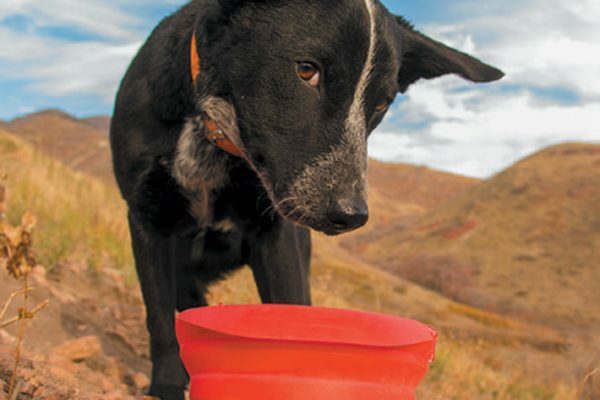 Your dog might drink from standing water, which can cause stomach upset, beaver fever (giardiasis) — or worse. Keeping identification on your dog is critical when camping. Put an ID tag on his collar and harness, and if you change collars for bathing, the “bath collar” should have an ID on it as well. Microchip your dog and ensure his chip information is up to date. Don’t push your dog beyond his capabilities when planning activities. An athletic, fit young dog will be able to keep up on a long uphill hike. A couch potato, brachycephalic (smush faced) breed or senior dog may not be able to keep up on a long hike, especially if the climate is hot. Offer your dog plenty of water, and check his paw pads regularly to ensure that they aren’t becoming sore. Check out Outward Hounds Pooch Pouch Backpack, a front carrier for small dogs; the Outward Hound DayPak, which securely holds all of your walking and hiking essentials; the colorful Standley Sport Life Jacket, because dogs love to swim and need to be safe; and the Crest Stone Explore Pack, which includes compression saddle bags and webbed straps, allowing your dog to move freely while keeping your essentials secure. 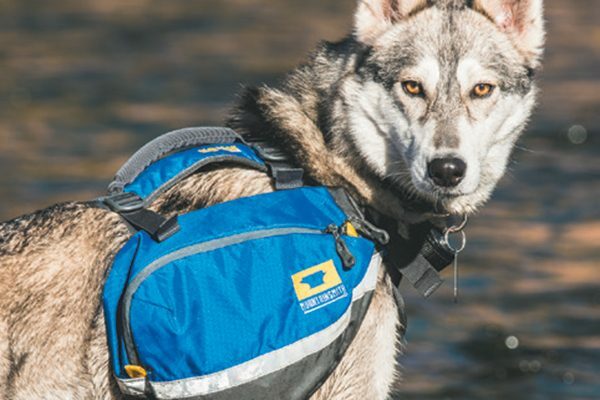 Mountainsmith’s K9 Dogpack is a “dogonomically” correct gear hauler, designed with the assistance of a sled dog veterinarian; Mountainsmith’s K-9 Cube makes traveling with a dog simple and organized; and Mountainsmith’s stuffable, washable, portable canine bed is great for base camp or trail, compressing down into its own stuff-sack for tossing in the back of the truck or backpack. Check out Ruffwear’s Highlands Sleeping Bag, a packable, durable sleeping bag for warmth, comfort and insulation on the trail; Ruffwear’s Jet Stream, a cooling vest which efficiently cools dogs during light and fast, high-intensity adventures through shading and evaporative cooling; the Ruffwear Swamp Cooler provides protection from the sun and cooling through evaporation. Kurgo’s Collaps A Bowl is barely an inch thick when collapsed, fits into a backpack or a dog’s backpack, or a tiny corner of your car, holds up to 24 fluid ounces and is dishwasher friendly and BPA free. Kurgo’s Quantum converts into a hands-free dog leash that goes around the waist or over the shoulder courier style and, with a quick change, it can become a double dog walker. 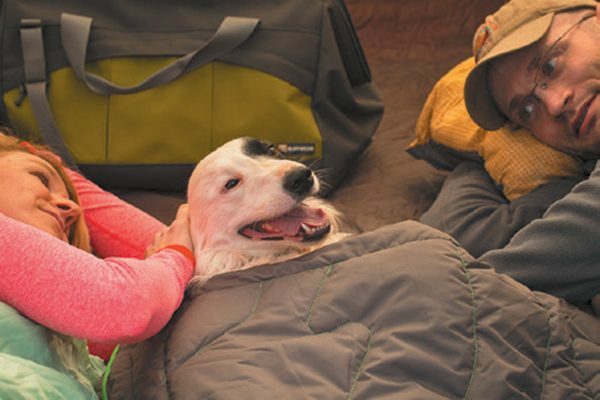 Tell us: Have you ever been camping with your dog? What do you pack or do when camping with dogs? Thumbnail: Photography ©Jupiterimages | Thinkstock. Nikki Moustaki is a dog trainer, dog rescuer and pet expert. She splits her time between New York City and Miami Beach, Florida, and is the author of the memoir The Bird Market of Paris. Visit her on Facebook, on Twitter at @nikkimoustaki and at nikkimoustaki.com. 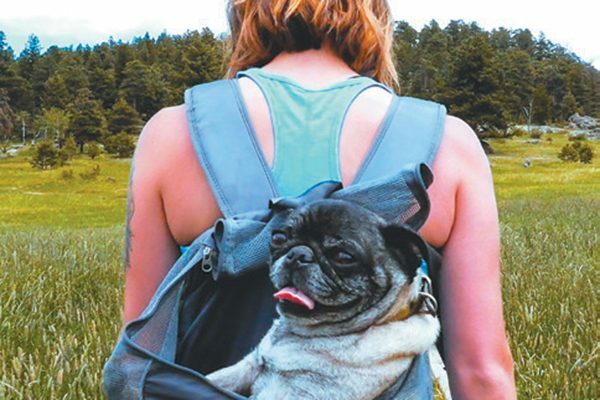 The post How to Prepare for Camping with Dogs appeared first on Dogster.